I told you they'd be more! Number 2 review of my new lipsticks is here (Check out my review of Impassioned here)! 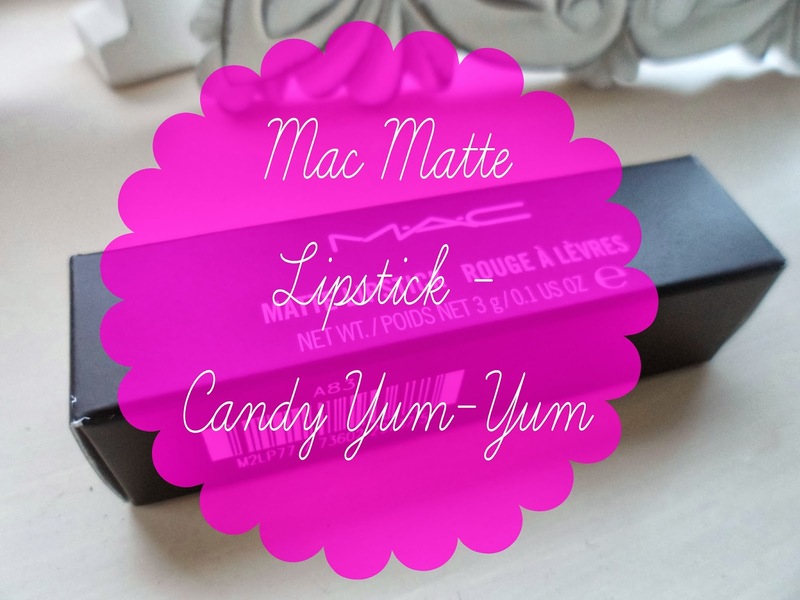 Today it is all about Mac Matte Lipstick in - Candy Yum-Yum. I didn't actually realise this was a matte shade - I'm so blonde sometimes! I only own a couple of matte shades but am definitely a fan. Even though it is matte it still has a gorgeous sheen about it and doesn't feel drying at all. I would recommend using a good lip scrub before using this too - lipsticks always need a good base to work well. TIP : If you don't have, want or like lip scrubs then invest in just a cheap manual toothbrush, use in a circular motions over your lips a couple of times a week for soft, flawless lips! The pigmentation is, like all Mac lipsticks, gorgeous! Just one swipe gives a fabulous opaque colour - which like I said before is always what I look for in a lipstick. If you like brights - this is the shade for you! A vivid fuchsia pink which stands out a mile will having you looking and feeling girly and glam in seconds! Perfect for summer days and girl's night's out - this would go so well with both a simple daytime eye and a something a bit more full-on with a pair of false lashes! What do you think then girls? Love it? Want it? Own it? .. or does a shade so bright scare you? W O W. That's all I have to say! Ohhh my god I need this shade, didn't realise how gorgeous it was! I was bought this for my birthday too! It's SO Barbie, I love it! I've kept it safe until Summer however!